© John B. Yeats (1839-1922). Portrait of Douglas Hyde, 1901, pencil on paper. The Niland Collection. 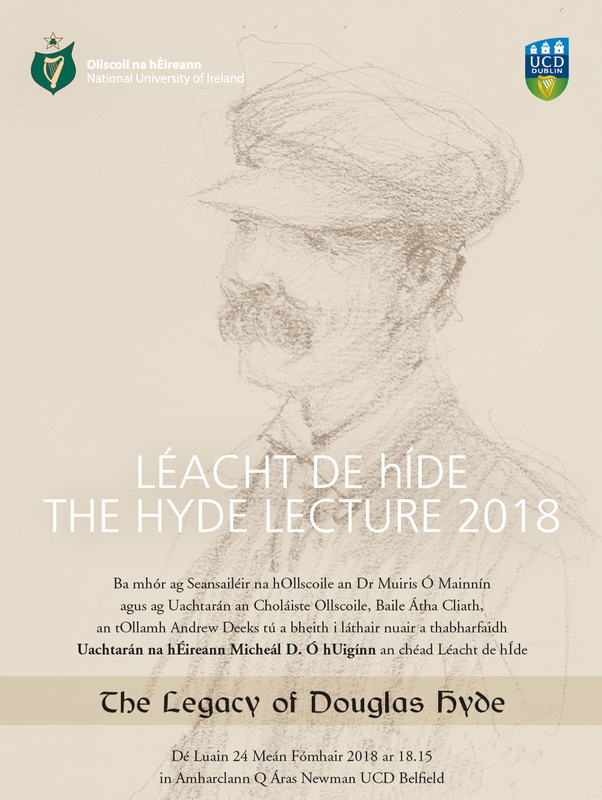 NUI and UCD are delighted to announce that the inaugural Hyde Lecture – Léacht de hÍde will be given by President Michael D.Higgins in University College Dublin on 24 September 2018 on the theme of ‘the Legacy of Douglas Hyde’. Douglas Hyde was the first President of Ireland, serving from 1938 to 1945, the first president of Conradh na Gaeilge (the Gaelic League) and the first Professor of Modern Irish in UCD from 1909. In that year, he was also appointed as a member of the first Senate of NUI and was an active member of the Senate until 1919. Given these strong connections, NUI and UCD School of Irish, Celtic Studies and Folklore are pleased to honour the memory of Douglas Hyde by collaborating in the establishment of this new lecture series. 2018 marks the 80th anniversary of Hyde’s presidency. It is also Bliain na Gaeilge, which celebrates the revival of the Irish language over the last 125 years since the establishment of Conradh na Gaeilge. It is intended that this lecture series will be bilingual, with lectures alternating in successive years between English and Irish. NUI and UCD are greatly honoured that the President of Ireland Michael D. Higgins has agreed to inaugurate this new lecture series in commemoration of Ireland’s first President by giving this first lecture.